We’ve been talking about summer fun this month and saw that many of you take your dogs camping! We asked our Facebook fans, What’s your advice for bringing your dogs along with you on a camping trip? ID tags, first aid kits, flea and tick repellent, toys and a bed for your dog where all on the list. Thanks everyone for sharing! Take a first aid kit with you for the dogs and bring lots of extra water. 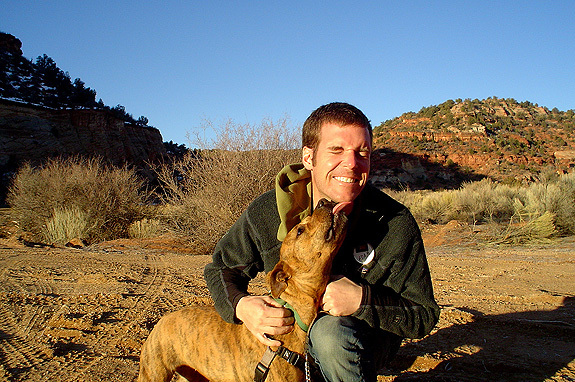 When on backpacking trips it is a good idea to filter your dog’s water too. Know your campground ‘before’ arriving – many have breed restrictions and many have very clear rules about dogs in general , so it’s good to have those ahead of time. We bring crates – so at night or for naps – our dog can come off the leash (most campgrounds require leashed pets) and stretch out safely. 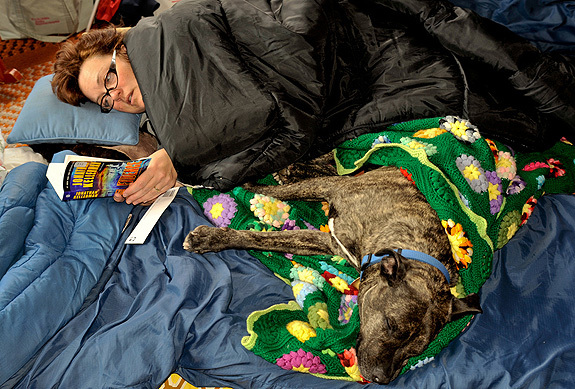 We take 6′ leashes for walks and long lines for tethering out with us while we are hanging out at the campsite. If boating, be sure you bring their life jacket along too! Keep your flip flops close to the tent door – so you can be ready for a midnight stroll if you dog needs a potty break in the night. And a good “shhh” command comes in handy too – because there are a TON of new sounds for our dogs to adjust to when enjoying ‘nature’ overnight at a campground. Print out a map (prior to the trip) to the nearest ER/Vet hospital (from your campsite/vacation spot) so if something should happen, you don’t lose time asking, or checking Internet etc. Also, pack up the doggy sun block – dogs can get sun burned too. Include Benadryl in the first aid kit (or in my case, an Epi pen for my boy). 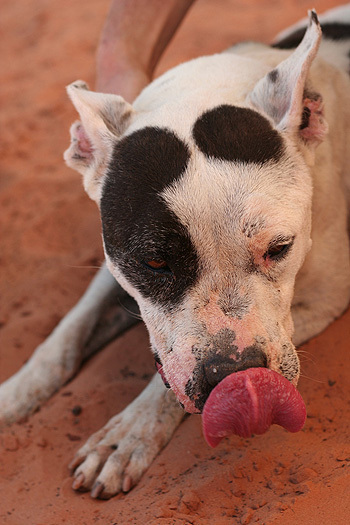 Certain bugs can do something nasty to your dog, especially if you’re far from a veterinary ER. The retractable leashes are fantastic for camping. They are good for hiking so you can give them slack on the trail but have them by your side when other people come by. And pack a bandana and camera! Flea and tick meds to prevent Lyme disease. Never leave them unattended and if you let your dog off leash, always be mindful of where they are and your surroundings, since not everyone likes dogs and not all dogs get along. Bring a pet first aid kit. My lab sliced her foot open while playing in the water on our first camping trip together. Invest in a decent doggie backpack (REI stocks a few great ones) so that your pooch can pack in his own food, water, and toys. We also bring a long nylon rope to serve as a tie-out for when we get to our campsite. It allows our dog a little freedom to explore at camp, without us having to worry about him roaming too far. Bring a good bug spray for your dog (and make sure it’s safe for them!). Skin-so-soft works, or I use this stuff called Flee! that is aloe and citronella based. Lots of water, life jackets are a must, extra blankets, toys, dog food, etc. We usually pack more for our dogs than we do for ourselves! We take old blankets to lay out so the dogs can lay down and not get dirty. (Mine are little prisses about getting dirty!) Also, we used leads to keep the dogs near us, while also allowing them freedom of movement. Worked out pretty well, though make sure to keep away from fire! Make sure they are updated on their flea and tick meds, bring enough food and toys! Even if you use a monthly flea and tick prevention, it’s also wise to bring a flea and tick dog spray. I pack Juno’s backpack, plenty of food, a toy, life vest (for swimming), shampoo, a regular leash, dog dish, treats and a long training leash. Juno caries her own water! Juno and I both share a queen size blow up bed – we love camping! I like to bring a tick key or tweezers for carefully removing ticks, just in case. 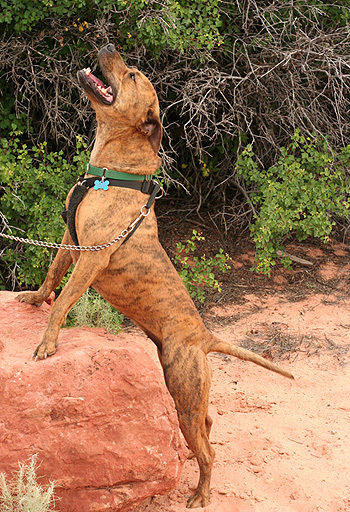 Practice basic obedience – a strong recall is a must, if you let your dogs off leash. Wildlife can cause many a dog to forget they are “civilized” and revert to instinct in a chase! 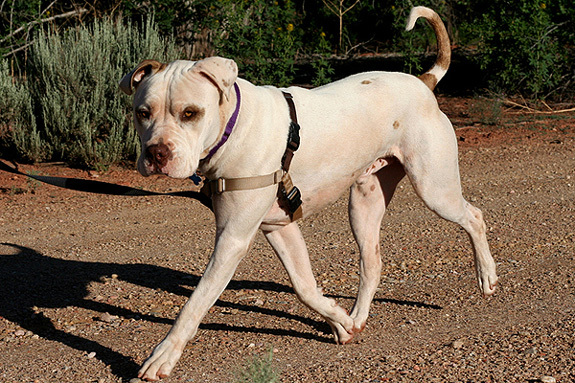 Off-leash dogs often disturb and chase wildlife, so keep them on leash, even in the woods! My dog prefers a posh cabin, far away from anyone who might decide to set off fireworks. She does not like tent-camping much! Also, make sure your dog is up to date on his heartworm medication. Mosquitoes are everywhere! I just got back from camping with my doggy! She has her own bag and in it is her medication (she has allergies) and we brought some OTC allergy medication, which was helpful. We packed an ointment for small cuts and scrapes, sun screen, 20+ ft. leash so she can roam the camp site, and her own blankies from home. Dry shampoo (you never know what they are going to roll around in!). It’s also a good idea to find a doggy day care in the area you’re visiting, just in case something happens and you need to board them. Bring their records too. We had a fantastic time! We learned this one the hard way this week: pack peroxide, Dawn dish washing liquid, and baking soda … in case you meet a skunk. We always bring a first aid kit, including super glue (for bad lacerations); dog-safe sunscreen and bug repellent; sleeping pad and sleeping bags/blankets; sweaters (my dogs are short-haired & temps can drop into the 30s at night even in mid-summer); dog-backpacks; collapsible bowls that can clip to collars; booties (to protect from sharp rocks when hiking); towels; plenty of water (dogs do get giardia). It’s also important to have your dog microchipped! 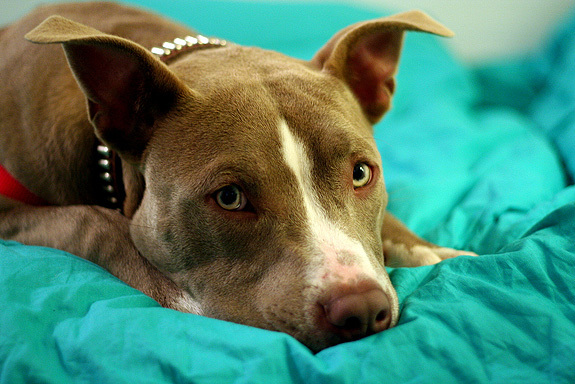 You have a much better chance of finding your dog if he goes missing far from home. Dog bed with waterproof cover, dog sweater and/or coat, Dog cool coat for hot weather, baby gate to keep dog from tearing screen door in trailer. ID Tags!! You never know what can happen while camping. Even the most responsible owner can have a dog get away from them. Tags with a current phone number and a rabies tag are the most important item. Make sure the info on your microchip is current! Bring the dog bed with you! Our Moose doesn’t do too well roughing it!